I feel as though I don’t listen to whole albums any more, unless I’m in the car, which isn’t very often. I’m so distracted most of the time that I’ll listen to a song here or a song there, or sometimes a big mix of songs. But when I do listen to an album as an album, I remember the very great pleasure of it. And the part that I like best is when there are one or two songs in a row that I love together. Usually it’s three songs, and it’s the part of the album I most look forward to…the jammy filling in the middle of the album, or the transcendent ending. For instance I love Franks Wild Years, which ends with Cold Cold Ground, Train Song, and then Innocent When you Dream. Does anybody else listen to albums in this way? With a trio of songs they look forward to somewhere in the mix? If so, add them to our Sunday interactive playlist, or leave a message in the comments and I’ll try to add it myself. It could be two songs or four songs, and it could be songs from a mixed tape that you’ve made or somebody made for you. The rules are very flexible here at The Ordinary! I wanted a fruit crumble, but also something I could carry around with me, something that would last a little longer, so I made this cake. 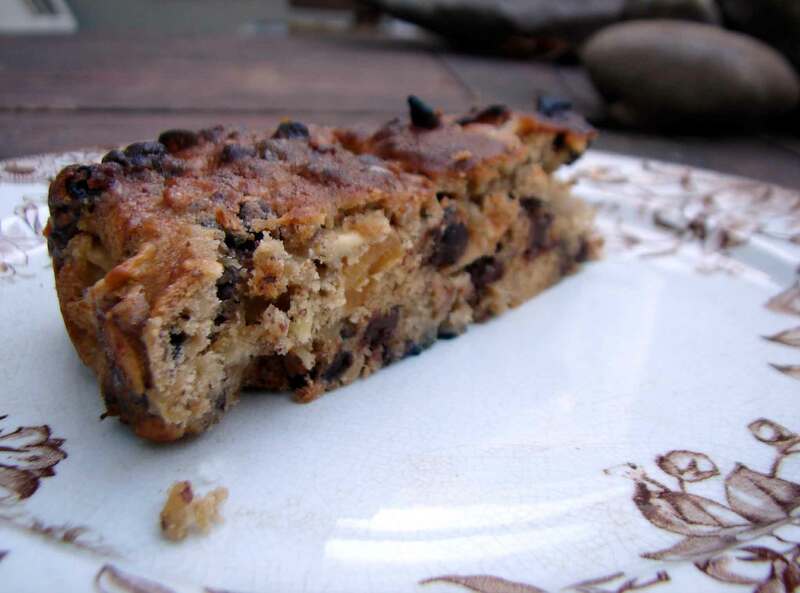 It has apricots, apples, golden raisins, hazelnuts, pecans and almonds, as well as chocolate chips. It’s like a fresh fruit cake, or a fruit and nut cake, or a trail mix cake. Good in the morning with coffee. Here’s a link to your interactive playlist. Hopefully it works this week!! Preheat the oven to 375 and lightly butter and flour a cake pan. In a large bowl combine the fruit and mix. In a small saucepan melt the butter and sugar together until the butter is just melted. Add the rum and vanilla, and pour the mixture over the fruit. Mix well. Beat in the eggs. In a food processor or blender, process the nuts until they’re chopped quite finely, but not turned into powder or paste. stir these in with the flour, baking powder and salt, and beat until everything is well-combined. Stir in the chocolate chips. You’ll have a thick, chunky batter. Spread the batter in the prepared pan and bake until browned and firm to the touch, about 25 minutes. This entry was posted in cake, chocolate, dessert and tagged apricot cake, fresh fruit cake, mixed nut cake, trail mix cake by Claire. Bookmark the permalink. Mmm, love the flavours here! Looks delicious! It does look good. Two favourite pairings spring to mind: Curtis Mayfield – Curtis, when We People Who Are Darker Than Blue goes into Move On Up; and Dr Feelgood – Stupidity, which is a live album. The last two tracks are Checking Up On Baby and Roxette, and it’s like a gear change from one to the other. Thanks, DaddyPig, perfect suggestions, as ever! Just added Slint – last two tracks of Spiderland. (and I’m seeing them live in a couple of weeks). Thanks. I think I’ll finally have time to listen to the list today! I can’t get stupid spotify to work. And I can’t get stupid RR to load all the comments. My computer’s at an age when it just decides it doesn’t want to do everything I ask of it!